That burnt up meatloaf you put out into your trash was delicious. The time you blamed your dog for knocking over the trash…me again! Oh, and all your other garbage was delicious, I regret nothing. Now, I don’t want to hurt you but get in my way and it can happen. I’m looking for a place to nest and your chimney is looking like a fantastic spot to raise my young. Whatever you do, don’t call Minnesota Wild Animal Management Inc. They safely remove raccoons like me and prevent me from coming back to my spot. They are the one wildlife removal company that keeps me out for good. While we like that they’re a humane animal removal company, we’d rather just take over your property. So if you are searching for wild animal removal in Ham Lake, MN, don’t call them! P.S., I just bit you. Now go get your rabies’ shots! Clever little things, aren’t they? Have you received this letter? Maybe not written down, but if you’ve ever looked into a raccoon’s eyes, you can take a big guess as to what they’re thinking. Unfortunately, raccoons can be dangerous and having them linger around your property only puts you, your family, and your other pets at risk. If you need raccoon removal, let Minnesota Wild Animal Management Inc., be your wildlife removal company of choice. Performing wild animal removal in Ham Lake, we are a humane animal removal company that specializes in the removal of raccoons. Raccoons are nocturnal and will typically sleep during the day and rummage the grounds at night. So even if you don’t see a raccoon, there are signs showing they are around. These animals will knock over your garbage, ruin your lawn, and this time of year they are starting to nest in chimneys. Not only is it dangerous for the raccoon but equally dangerous for you. 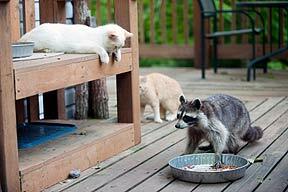 Raccoons carry feces and parasites that can easily transfer to humans. They also can develop rabies, infecting any mammal around. Removing a raccoon is very difficult and should be left up to a humane animal removal company that will do a great job. Minnesota Wild Animal Management, Inc., performs wild animal removal in Ham Lake by safely removing them from the area and then sealing up the entry spot so they are no longer a threat. If you have a raccoon problem, call a wildlife removal company you can trust. For wild animal removal in Ham Lake, MN, call Minnesota Wild Animal Management Inc., today at (612) 237-8282. Ignore those raccoon letters and listen to an expert today! Our emergency line is open 24/7.